Domain Name Registration and Web Hosting is one of the best approaches to becoming a successful blogger, this brings about the more intense need of getting a nice reasonable name that will fit your niche. Today in this article, you will get to know the cheapest domain registration and web hosting from the best domain registrars/web hosting provider site known as DomainKing. DomainKing.NG is one of the best global government accredited domain registrar and web hosting provider that started offering their services to Nigerians in October 2014 with its own .COM domain for just N499 offer…. So Amazing Right? This was the cheapest so far then. DomainKing also offers the most affordable web hosting plans to start your website or blog. However, their pricing is very pretty decent for a number of features support that you get. Their Plans starting from just N93/month, their services are pretty awesome if you are looking for quality customer support, faster loading and 24/7 online visibility of your site? They can serve you for the complete value for money. DomainKing went as far as to provide an affiliate program that lets you earn up to 30% commission on their web hosting products when you refer a friend or someone to their website and that person orders their hosting through your affiliate link or using your unique coupon code. Nevertheless, you can as well join their affiliate program if you are ready to earn with your blog. Step 4: Now Search for a Good and reasonable Domain name that will fit your niche and attract your readers and visitors, if you already got one then check for the available extensions. Wow,,,so interesting you will also be given 2 free email accounts!!! Step 7: Then click continue you will be given an option to choose your payment methods and then select your preferred one, you will be given an invoice like the above image. Step 8: Once after successful payment, you will be sent a confirmation email and now your domain name is being registered. 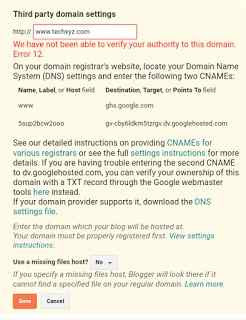 Here now, this will help you to convert your blogger blog to a custom domain name like www.yourdomain.com easily. 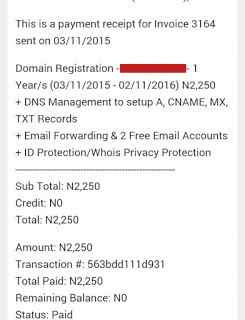 Still on that, after your successful purchasing of domain name first, and your domain is been registered. Now you have to setup your domain name to your blog. 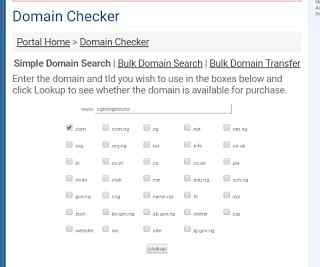 After the blogger setups, whenever someone will type your domain name like www.yourdomain.com in a browser address bar then it will automatically open your blogger blog with the activated domain name. Alright, let’s continue with the setups, following these steps below! Step 1: Login to your Blogger Blog. Step 2: On the Left of the navigation bar you need to click on "Settings" as shown below in the image. 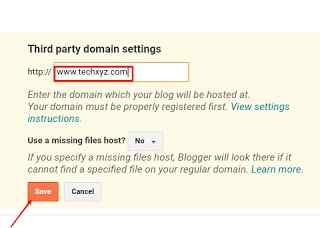 Step 3: Now you are on Settings > Click on Basics page on your blogger blog, here you will need to make few changes to integrate it with your custom domain name. Step 4: Scroll down to Publishing section and click on "+ Set up a third-party URL for your blog" as shown in the below image. Step 5: Now you need to type the URL of the domain you have purchased and then click "Save" button as shown in the image below. Note: Keeping in mind that it must begin with www in order to work. You could mention blog.yourdomain.com or www.yourdomain.com or whatever URL you want your blog to be. Hence, www is preferred if you want to keep the blog on the main domain. Step 6: You should see an error, and two CNAMEs listed below. The first CNAME is the same for everyone, Name is being known as "www" and Destination as "ghs.google.com". Now, the second CNAME is made particularly for your blog and your Google Account, which is therefore different for each person and likewise each blogger blog, try to keep note of that and bear it in mind. You need to send these CNAMEs record to the domainking registrar through their default email address so they can set it up for you. Step 7: Click the Save button below it, Oooppsss, You got an error message! Like as seen in the above image written in red color, yes it's normal, Don’t worry. How to enter CNAMEs in your Blogger Blog domain's panel? After getting your blog CNAME's record you can send it to DomainKing using their default email address (support@domainking.ng) and they will add CNAMEs record for you. They will configure all the required settings for your blogger blog. However, they will now inform you on your email once all settings are been configured properly by them. After that, then you will need to wait for few hours for these settings to work properly. In most cases you don’t need to wait for that much, once after setting your CNAME’s record by them, your site will be connected immediately. Nevertheless, since you received an error message while trying to save your settings during the initial setup with blogger.com, the setup integration was not completed properly. Now, you just need to save the settings at the Blogger.com's end, so that Google knows the process is being completed at their end and they will redirect your blog to your activated domain name. Follow the steps below to complete your setups now. 1. Repeat the Step in which you saw an error message, and the two CNAMEs were provided to you. You need to click "Save" button as given in the below image. Therefore to achieve that you will also need to enable the redirect settings from your blogger blog dashboard so that it will redirect all non www domain traffic to your www domain. 1. Still on your blogger dashboard: Go to Settings, Click on the basic page of your blogger blog. Below the settings tab in blogger. 2. Scroll Down, under publishing section you need to click on Edit, next to your custom domain name. Now edit blog address in blogger blog as seen in the image below. 3. After that, now you need to check the option "Redirect yourdomain.com to www.yourdomain.com". Oh yes; you have now finally set up your custom domain name which you purchased from domainking into your blogger blog successfully. Now your new blog URL will be like this example; www.yourdomainname.com. Congratulations you have successfully gotten your own custom domain name. In addition to the above guides, make sure to follow the links and steps given for proper achievement. 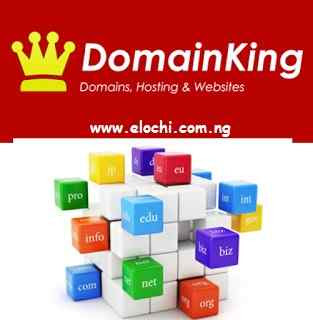 More so, domainking has become the cheapest domain registrar so far, you can check out their extensions price tag from the site here www.domainking.ng. Hopefully, I believe these steps are easy to go with. Remember to drop your comments below if you found this post worthwhile. We love your comments. Thank you! You are welcome James, so glad you are here. keep visiting for more updates like this. thank you! Thanks for coming, hope to see you back here soon. Thanks so much, its my pleasure. so glad you loved it. hope to see you again. Hey khan, Thanks for your kind comments. glad you found this post interesting. We will keep providing you with more unique contents like this, keep visiting us for more updates. Wow, thank you for your kind comments. so much glad for recommending this post to your fellow and founding this post worthy. i really appreciate. hope to see you again soon. have a nice day buddy! hello, welcome and thanks for visiting ElochiBlog. i do appreciate for your acknowledgment, and founding this post helpful. keep visiting us for more updates. You are welcome, hope to see you soon. Thanks George, nice having you here. Keep visiting Elochiblog. thanks for coming, hope to see you again soon! Nice having you here, keep visiting ElochiBlog! Thanks for coming, am glad you found this post worthy. Im happy I found this website, I couldnt get any information on this subject prior to. I also manage a godaddy coupon website and if you want to ever serious in doing some visitor writing for me if possible feel free to let me know, im always look for people to check out my blog page. Please stop by and leave a comment sometime! Thanks for coming, Albert, hope to see you again soon.